Most of you know I've been dealing with a broken hand for a while. It is finally starting to heal, but it's been inside the cast and braces for so long that it's hard for me to move the broken side of the hand now. The muscles, tendons and whatever else have become stiff are not used to moving. My pointer finger and middle finger are okay because they've been out of the cast for a while. But, my pinky and ring finger have been locked up together for so long that they don't bend at all. I feel like it's going to be forever before I'll be able to make a fist again. I can barely get my fingers around a glass or bottle right now. I was using my hand a lot yesterday and when I took the brace off my hand was extremely stiff and a little sore. 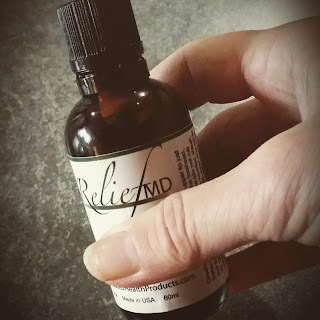 I was recently given the opportunity to try out Trusted Health Products ReliefMD. They call it a "Massage in a Bottle." I figured I might as well try it on my fingers and hand. I was sent the ReliefMD for free to facilitate this review. All opinions are 100% mine and no other compensation was received. Itching, Cold Sores and burns. ReliefMD has Almond, Eucalyptus, Peppermint, Wintergreen, Camphor, Spearmint and Olive Oils. I found it interesting that Germany has approved camphor for the treatment of Rheumatism. And Eucalyptus oil is supposed to help stimulate blood flow. Now that I can take my brace off and try to work on some physical therapy exercises and use my hand a little, I can put ReliefMD on my hand and see if it helps. I put it on my hand this morning because it was feeling pretty stiff after using it yesterday. I put a couple drops on my knuckles and the top of my hand and it actually does feel better now. The directions also say to put one drop on your forehead and one drop below your nose. I didn't do that part. I do love the Wintergreen smell. That's the smell that stands out to me the most. That smell makes it a little different than other pain relief gels I've smelled in the past. The hardest part for me with any of Trusted Health Products line is remembering to not "rub it in". You're just supposed to put it on the skin and NOT rub in. For some reason, I always seem to want to rub it in like lotion. I like the results that I've had with this product. But as with most things, you might not have the same results. Right now, I'm using my hand to type and although it's stiff from not being used for ten weeks, it's not stiff from the work I did with it yesterday. ReliefMD definitely helped take the edge off the pain and stiffness. I will be hosting a giveaway as a separate post! Make sure you check that out if you'd like to enter to win a bottle for yourself! You can find the giveaway HERE!!! Trusted Health Products Facebook page.